The latest Divi feature update is a fabulous Find and Replace function that is going to save you a lot of time, effort and frustration. This new feature isn’t a “text” find and replace, it’s a “settings” find and replace and it allows you to make sweeping changes across your entire page with just a few mouse clicks. It comes with robust and refined targeting tools that allow you to decide exactly what and where you want to find and replace. And if you’re using Divi’s Free Layout packs, this is the perfect tool for customising them to match your own or your clients brand. The new Divi Find and Replace feature allows you to change settings on a page and to target those changes with just a few mouse clicks. It’s also the perfect tool for customising Free Divi Layout packs or making changes to your own saved designs. 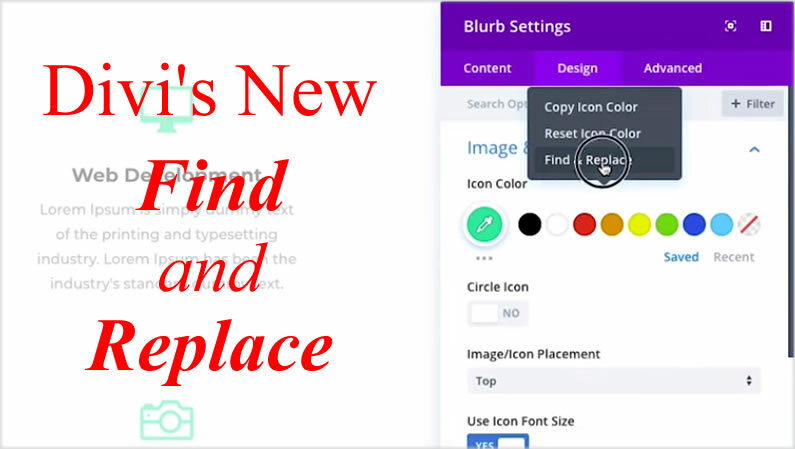 This short video by Nick Roach of Elegant Themes introduces the new Find and Replace feature, explains how you can change values on specific areas of a page and shows how easily you can customise Divi’s free layout packs. Adjust Values Across Your Entire Page And Across All Modules Instantly! – Find and replace is a really unique feature that allows you to quickly adjust the design of your entire page with a single click. 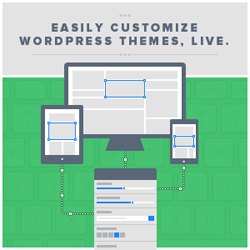 Join Elegant Themes and download the Divi theme today. Complete with a 10% discount! 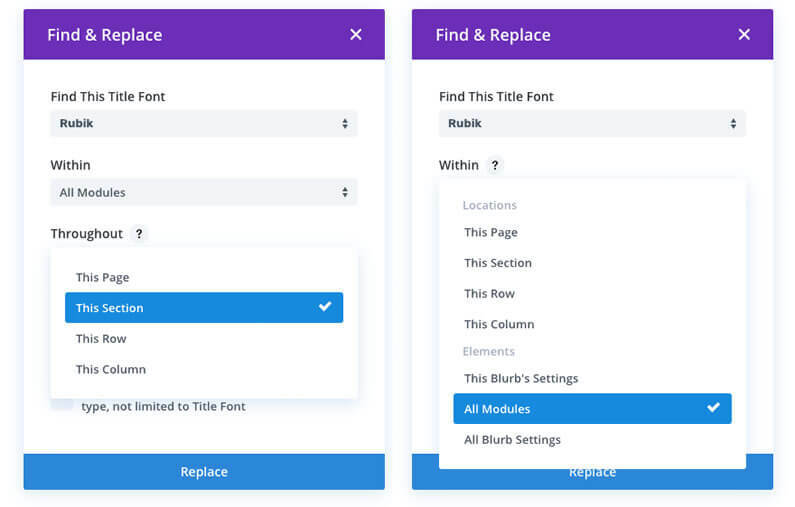 All settings in the Divi Builder supports find and replace, all you have to do is right click on a setting and choose the Find and Replace option. This will allow you to search through your entire page, or a particular part of your page, for specific values and replace them with new values. What this means in real terms is that you can change your entire page’s colour scheme, fonts and just about anything else, with just a few mouse clicks. Find and Replace is not just a blunt instrument, it comes with robust and refined targeting tools that allow you to decide exactly what and where you want to find and replace. You can find and replace particular values within particular areas or you can find and replace values across your entire page. You can limit replacement to particular option types, or you can replace all found values across all modules and all options. 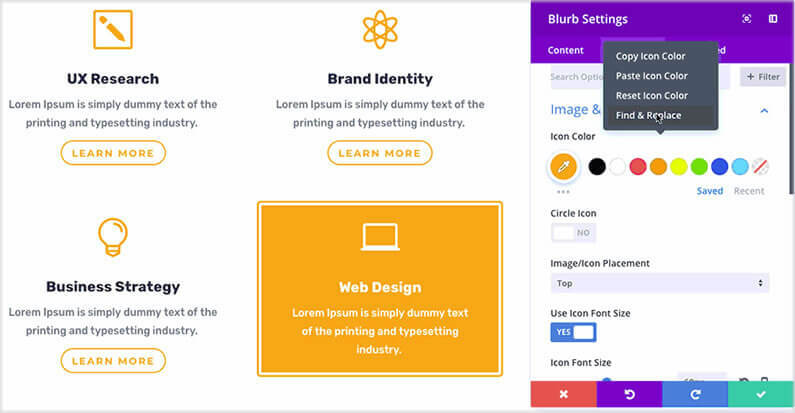 Find and Replace is a great tool for customising Free Divi Layouts to match your own or your clients brand. In the past, changing dozens of colours and fonts one by would have taken a lot of time. The new Find and Replace feature allows you to perform batch edits across your entire page instantly. A great saving on both time and effort. 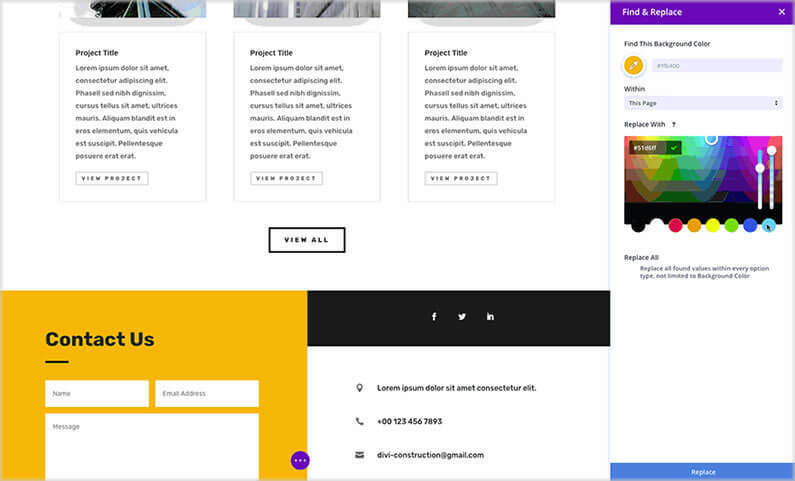 Being able to carry out targeted find and replace changes is a quick and easy way to play around with colour combinations, font pairings and lots of other design elements, when you’re designing your pages. It’s also a great way to customise Divi’s Free Layout packs to conform to your own or your clients branding. However you use it, the new find and replace feature is going to save you a lot of time, effort and a whole lot of frustration. Find And Replace Is An Incredibly Effective Tool That Will Save You Hours Of Editing Time – Now you can quickly find and replace specific values on your page, and even control the scope and location of your search to target specific elements. Why not use Divi on your next project? If you’d like to use Divi’s new Find and Replace feature on your next project, then please feel free to use my Divi theme 10% discount link below. My thanks and gratitude to Elegant Themes for the graphics and video of the Divi Find and Replace feature, used in this post.